When You Wish Upon a Star...... Dreams Come True! Dental Exams in your home! Can't make a visit to a Veterinary Hospital? Our unique medical/dental practice was among the first in the country established to care for patients who are unable to be treated in a traditional veterinary office setting. For over 40 years, we have been working to remove barriers to access to care by delivering premium dental care to patients with unique challenges at an affordable fee!!! Is your dog stressed coming to the veterinary hospital? Does your cat hate being put in a carrier? #DrDonDeForgeIntroducing: StomaSurg➽ No. 33 Removing Oral Pain One Patient at a Time! Gingivostomatitis in the Cat The pathology of gingivostomatitis can affect gingiva, mucosa, tongue, palate, and the pharyngeal area. The salient clinical signs of gingivostomatitis are: swollen, ulcerated, and bleeding gums; lack of appetite or the inability to eat; consequent weight loss; cachexia; excessive salivation; blood in the saliva; halitosis; pawing at the mouth and SEVERE ORAL PAIN! StomaSurg➽ is the first oral surgery that completely removes Gingivostomatitis in CATS. It is now available in CT and NY. Attention: Doctors,Veterinary Nurses, and Stomatitis Cat advocates. 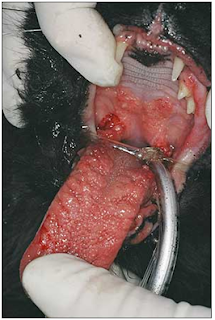 Today’s Topic in Animal Dentistry outlines my oral surgery using GBR to cure cats from stomatitis. It is the only surgery to date that can bring complete resolution without remission. Questions can be directed to DonDeForge100@gmail.com or you can call me at 1-800-838-3368. The classic treatment of feline Stomatitis with whole mouth extraction or extraction of the teeth distal to the canine teeth has proven to be non-productive in half of the patients treated.